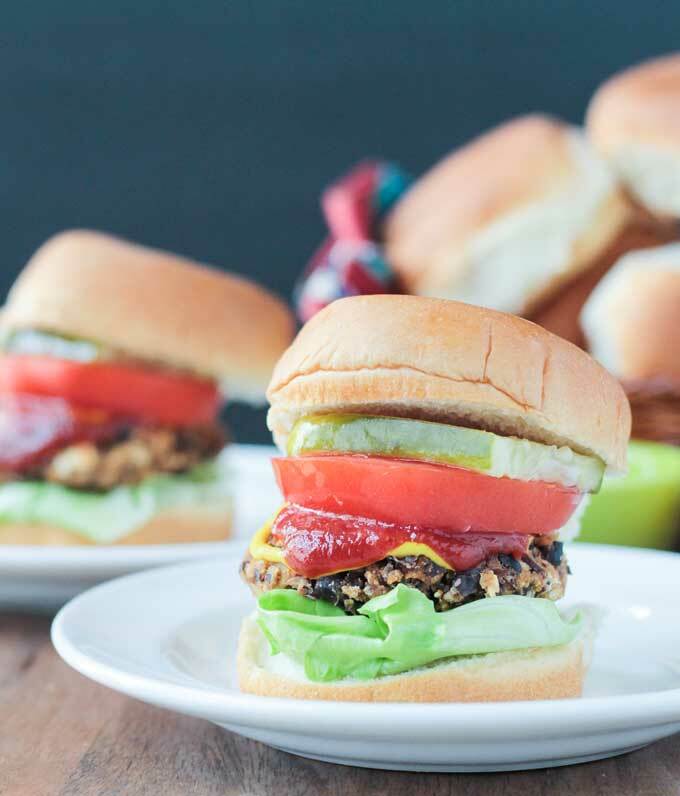 These Black Bean Salsa Burgers might be the easiest veggie burgers you’ll ever make. They can be on your table in 15 minutes and require only 4 ingredients! I’m kind of obsessed with making veggie burgers. You are likely to find one on our menu each week. And each week, it’s also likely to be a different recipe. I have a few favorites that I return to often, but I love experimenting with different flavors and textures. I have found, however, that I generally prefer black bean burgers. These Black Bean Salsa Burgers are so simple, it’s almost embarrassing. You can whip these up in literally just minutes. They hold together well, so stick them on a bun and load it up with your favorite toppings. Serve them with these Crispy Potato Rounds and you’ve got yourself a meal! Who doesn’t love a good burger? They are pretty much a staple of every American diet. You’ll find them at every summer gathering on the backyard BBQ and in nearly every restaurant you’ll ever step foot. No need to get fancy either – a simple burger with ketchup, mustard, lettuce, tomato and pickle (and maybe raw onion, but that’s not for me). It’s a classic. I don’t think I have to tell you that the traditional loved American burger is made from beef. But, what about the vegetarians of the world who want to enjoy a hearty burger loaded with their favorite toppings? 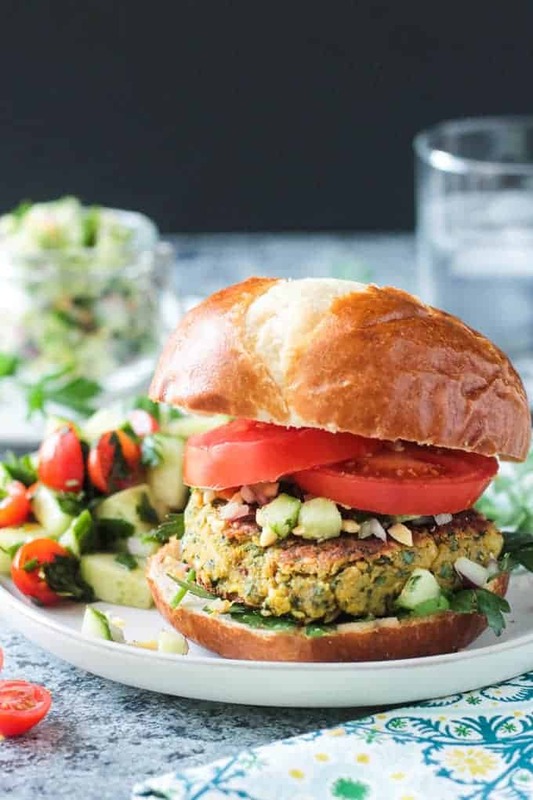 There are many versions of veggie burgers out there and lot of them have a variety of spices, herbs, and veggies in the burger “meat” itself. While these are super yummy, it sometimes limits what toppings will go well. That’s where these Black Bean Salsa Burgers come in! 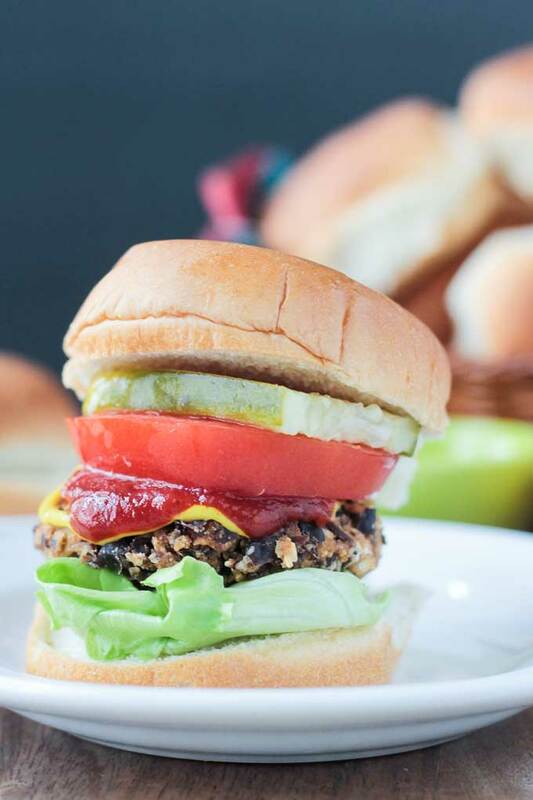 The perfect simple black bean burger to add whatever toppings you desire. You can even melt some vegan cheese on top. And what better to go with a hearty burger than some kind of potato? Instead of fries, here I decided to slice up some potatoes super thin and bake them until crispy. 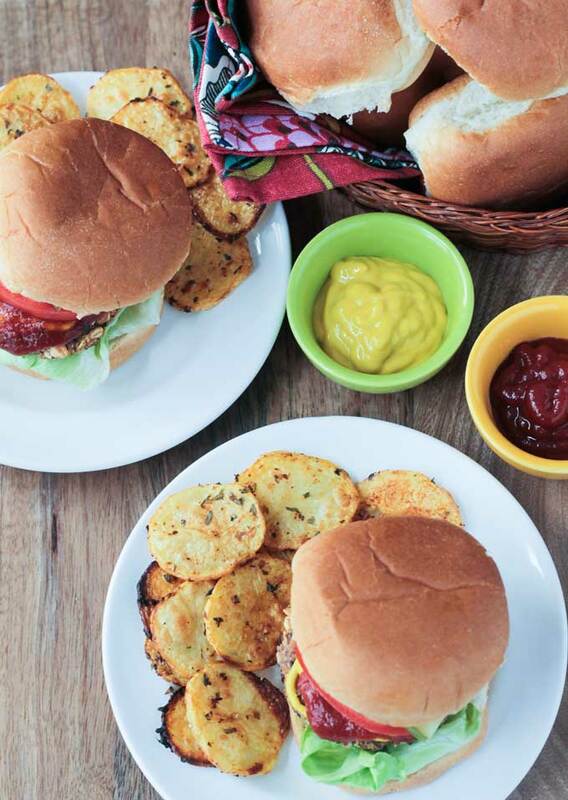 So grab a plate and load it up with these Black Bean Salsa Burgers and Crispy Potato Rounds! Who says plant based food is boring? 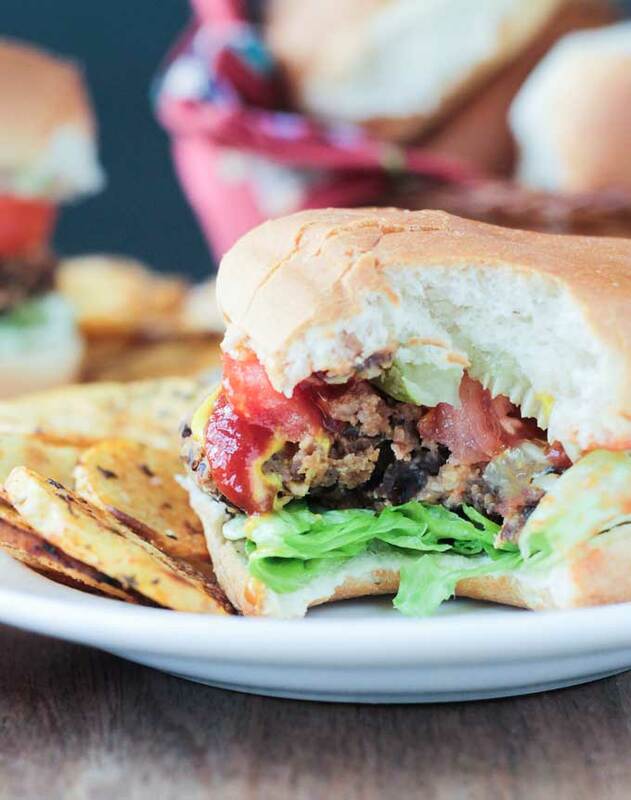 I hope you love these Black Bean Salsa Burgers as much as we do. If you’ve got 15 minutes, you’ve got dinner on your table! And one that your whole family will love. Please leave me a comment below with your feedback and star rating after you try them. I can’t wait to hear what you think! You can also find me on social media, so snap a pic of your remake and be sure to tag @veggie_inspired and #veggieinspired so I don’t miss it. Chow down, friends! 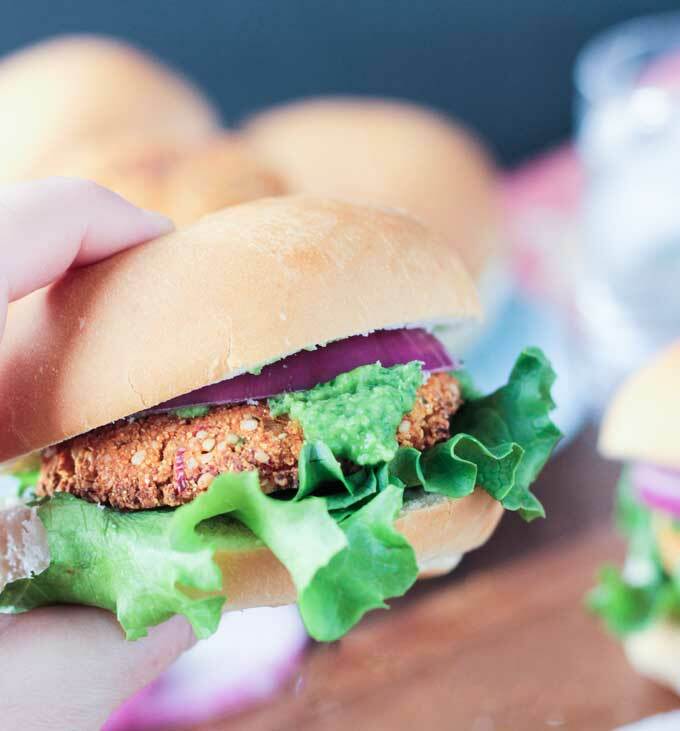 The easiest veggie burger you'll ever make! All you need is just 4 ingredients and 15 minutes! This will become your new go-to weeknight recipe! Mash black beans in a bowl with a fork or potato masher. Add the remaining ingredients, except the oil, and stir to combine. Depending on how liquidy your salsa is, you may need to add more flour. Add it 1 tbsp at a time if needed, mixing after each addition. Likewise, if your mixture seems dry, add 1 tbsp more of salsa at a time, mixing after each addition. Divide mixture into 4 sections. Form each section into a patty and place on a large plate. Refrigerate plate of burger patties for about 20 minutes. This step is OPTIONAL, but does help the mixture set and stay together. If you don't have time for this, skip it; your burgers will be just fine! Pan fry each burger patty for 3-4 minutes each side until lightly browned and crispy on the outside. Assemble burger on bun with your favorite toppings and enjoy! Roast for 20-30 minutes, turning the potato rounds over 1/2 way through, until crisp. 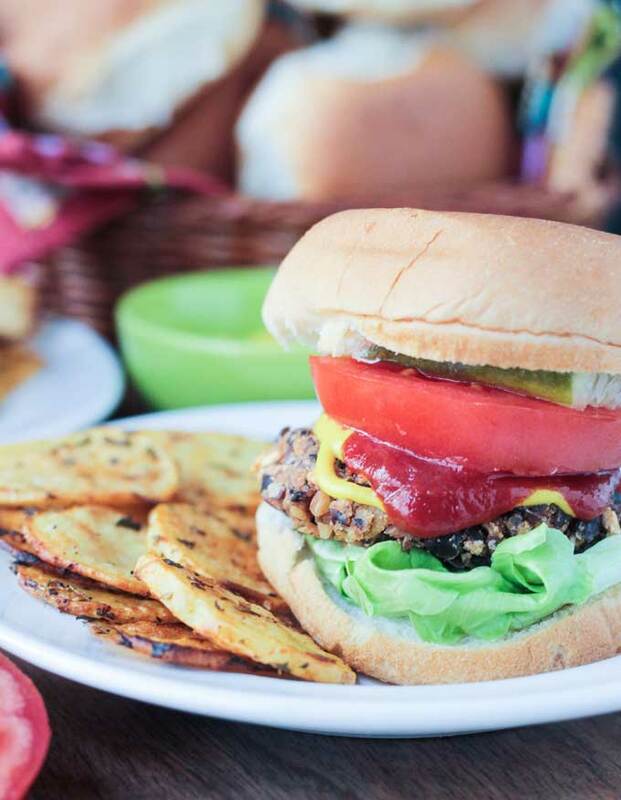 ~Use certified gluten free oats to make this burger gluten free! ~Nutrition facts includes burgers w/ buns and potato rounds, but not toppings. Could you use Sweet potato’s for the potato rounds? Didn’t see these comments way below until after I made them. Sorry, Kathryn. Just updated. You can try adding more oats or breadcrumbs and remixing. I have made this recipe a few times before, and the patties are so tasty! I’ve always eaten them fresh or within a day or so of cooking, but I have enough ingredients on hand that I was considering freezing a batch for quick meal prep. Have you tried freezing the patties, or do you think I should modify anything about the recipe before freezing? Yes, I have! They freeze beautifully. Nothing different needs to be done. I’ve frozen them both before and after cooking them and either way works! So glad you like them. Thanks, Melody! My daughter was on cooking duty, she didn’t drain the beans I’m assuming she should have but it isn’t in the instructions. Yes, I always rinse and drain them…I’ll update the instructions now. However, it shouldn’t matter too much…maybe just need to add a little extra dry ingredients. I made these burgers last night. I used a smoky salsa and topped them wth fresh avocado. They were SO delicious and easy! They will definitely be on my regular rotation! That’s so awesome to hear, Sam! Happy that you enjoyed them! 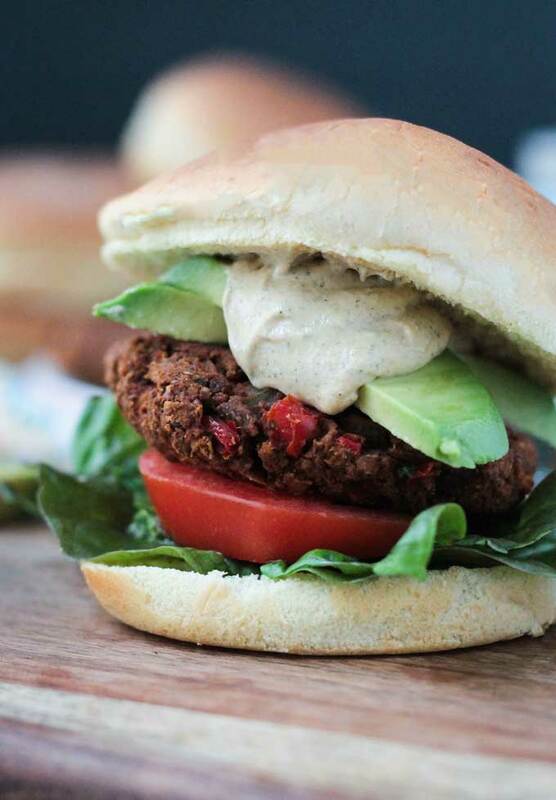 I love veggie burgers too, this recipe looks amazing! I am always looking for quick and easy recipes, thank you. I’ve made these twice so far and they are my new favorite! My husband is a big meat fan, and he really liked these as well. Quick, easy and delicious. Hi, Kate! Thank you so much! Glad to hear they are winning over omnivores too. And you can’t be how easy they are, right?! Thank you for stopping by to let me know. Have a great weekend! New to veganism and so I have a question for you; what buns do you use? Having a hard time finding vegan burger buns. Hi, Melody. Arnold brand is vegan and can be found in most grocery stores. I get them at Target. Oroweat is also vegan. If you need gluten free as well, Rudi’s hamburger buns are vegan. Store bought isn’t the healthiest (Rudi’s is probably the healthiest of those 3 I listed), but we don’t use buns all that often so I don’t worry about it too much. You might also want to check the fresh bakery section of your local grocery store….just be sure to read the labels. I have never tried making my own, but I know there are lots of recipes for homemade vegan hamburger buns online, so that’s an option too. Good luck! I seriously love this recipe! It’s simple, quick and very good. Being new to veganism I am happy to be able to make yummy burgers which fills the meat burger void nicely. I was really shocked as to how full I get after one burger, plus the potato rounds. Thank you for this recipe, it’s a new staple! Thank you, Erica! I’m so happy to hear that you love them! Great feedback. Sometimes simple the best. Enjoy your weekend!! Looks incredibly good! Perfect for any day of the week! Thanks, Meg! Definitely a great meal any day! Thanks, Diane! This is the recipe that gets made most frequently in my kitchen. So easy and the kids love them! Not only do I want that good lookin’ burger, I want the chips you served alongside. Thank goodness you gave us that recipe, too! This is a great one to start with, Ilona! You can load it up just like a regular burger. I hope you love it! Thanks! Pinned too! 😀 It looks amazing. I gotta try this one … soon! Thanks, Cris!! They are so easy! You won’t be sorry! No way, 13 minutes!!!?!?! Pinned! What a great recipe! I know, right? It’s so easy! Hope you love them! Made these tonight using chickpeas rather than black beans (was out) and was so impressed by how great they turned out! For such a simple recipe, these patties were delicious and didnt fall apart at all. I love how salsa is the liquid ingredient! I added some extra spices, a bit of Dijon mustard and some toasted sliced almonds for crunch. I wasn’t sure whether the oil in the ingredients list was supposed to be added to the mix or used for the cooking so I added it to the mix. I tend to inadvertently over complicate my veggie burgers- these’ll be my new go-to. Robin, thank you so much for this awesome comment!! I’m so glad you liked them! The oil was just for cooking, but if it worked how you did it, no worries! I love the idea of adding some nuts for crunch…I’ll have to try that next time. But, yeah, burgers that fall apart and smoosh out of the bun are just no fun, right? Thanks again for stopping by. Have a great weekend! I can’t wait to try these but like robinsveganlife, I was under the impression that the oil went into the mix because Step 2 says “Add the remaining ingredients and stir to combine.” I’m glad to have seen her comment and your reply as it’ll cut down on the fat content of the finished product. Oh, gosh, I will change that in the instructions right now. Thank you for bringing that to my attention. I can’t believe I didn’t change it before. I hope you love them, Susan. They are my go-to meal when I need something quick and easy that the whole family will love! So glad you liked them! Good to know they turn out great in the oven too! Thanks! I love anything black-bean-and-salsa and these look great! This burger looks great! The simplest recipes always seem to be my favorite ones. Plus, with the million different kinds of salsa I always buy, it could be a different burger every time. I am a salsa addict too! My favorite is the smoky peach from Trader Joe’s. Not sure how that would be in a burger, but I might have to try it! Hope you like it!